Three unique artists with three distinct voices provide a journey of discovery in new sounds and textures. Each track is an exploration of new sonic territory, with a different combination of instruments and approaches. If you are a fan of free improv and experimental music then this CD is a must. Randy Raine-Reusch - khaen, ajeang, biwa, zheng, changgo, suling gambu, prepared zheng, bowed zheng, sho. Do you find yourself alienated by some of the more alien dialects of improvised music? Then here's a terrestrial adventure for you! Where some overfamiliar line-ups might come across as lunar or just lunatic to the layman, our heroic trio of Henry Kaiser, Müller and Raine-Reusch (comprising guitar, 5-string bass and more exotic Asian instruments than The Sun City Girls could have carried) skilfully and playfully navigate, sail, trudge, clatter, slither, twang and twitter their merry way through a netherworld of hostile and exotic environments, their descriptions as vivid as any of David Attenborough's. Kicking off with a collision of Terry Riley's In C and the smooth, soaring overtones of Robert Fripp in Eno team-up mode, the opener, 'Khaendid', expands slowly, like a strangely angled tent on a misty mountainside, while Kaiser-bird scours the dimpled exterior for an entrance. Although the piece is titled after the bamboo-piped Khaen that lends its foreign flavour, it is Kaiser's guitar that dominates – as benevolently though, as his partners underpin. However, this and every other musical situation are both provisional and fleeting. 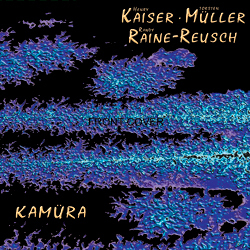 Raine-Reusch exchanges Asian instruments with each track, as Kaiser and Müller modify their mood and movement, casting aside all past climatologies. The trio alights briefly at their point of departure only on the iridescent finale, 'Sho', which reflects the summer twilight sound of 'Khaendid' back at its source. Musical references are oblique and varied throughout: a distant strain of bluegrass is dismembered and autopsied in 'Azhe'; the biwa in 'Biwa' harks back to Takemitsu's 'Harakiri', but divested it of its melodrama; the chilling piano-string resonance of 'Zheng' evokes a Charlie Gocher nightmare realm; there's an echo of Toop & Eastley's ghost-baby oubliette in 'Suling Gambu'. Amid the playful plucks and scrapes that deny grounding to the centre of the album, one catches vaguely recognised musical motifs recast in a dream-light, the way one's friends sometimes wear different faces when visible in the unconscious. Disconcertingly, it is the more distinctive, agitated 'improv' chattering that provides some kind of human provenance to the experience. In my experience, the best improv will not only beg the question 'who does what?' but also 'what the hell are they doing???' At its best, Kamüra achieves this with graceful aplomb, voices fusing and fissioning as naturally as breathing. The trio sounds set on strip-mining the occasion for every possible sound, while maintaining the ebullient new friendship of compatriots in an unlikely location abroad.